Use this eTool to complete the task in problem A-42. Your Task: Working together, organize the sequences into families of similar sequences. Your team will need to decide how many families to make, what common features make the sequences a family, and what characteristics make each family different from the others. Read and carry out the directions that follow. As you work, use the following questions to help guide your team’s discussion. • How can we describe the pattern? • How does it grow? • What do they have in common? 1. Click the circle at left of each part starting on line 6 to show/hide the graph. 2. Click the arrow to show/hide the table. 3. Click and hold on the colored circle on the table to view the settings. 4. 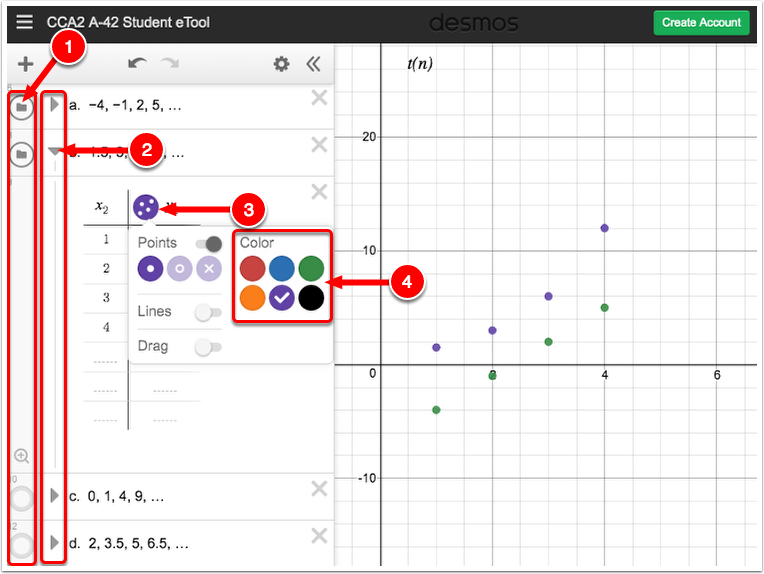 Select the color you want to use to group the graphs.